Swim and lounge at Orient Beach and Maho Beach on this half-day excursion from St Maarten. Jet ski, paraglide or sail at Orient Beach, then grab a snack at one of the many bars and restaurants there. Travel to Maho beach and watch jumbo jets fly overhead to land at the nearby airport. A guide, complimentary refreshments and round-trip transportation from your St Maarten hotel are included on this excursion. This is one of the few tours that visits beaches on both the Dutch and French sides of St. Mateen island. Meet your friendly guide at your hotel in St Maarten and board a comfortable, air-conditioned van for transport to your first beach stop. Onboard, enjoy complimentary refreshments like water, beer, soda and rum punch. Around midday, return to the vehicle for the trip to Maho Bay Beach. 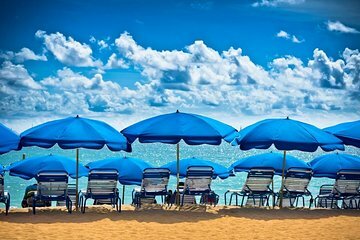 Famous for its proximity to Princess Juliana International Airport, the beach is a great place to see jumbo jets fly in and out of the island. Stroll the white sand beach, lounge in the sand, or watch the waves crash on the rocky coast during your 2-hour stay here. Visit the Sunset Beach Bar and Grill for lunch (own expense) while listening to a live feed from the airport's control tower. After your day of fun in the sun and sand, enjoy drop-off at your St Maarten hotel. We chose this excursion so we could visit a beach on both the Dutch and French sides of the island. Unfortunately Orient Beach was devasted by Hurricane Irma in 2017 but we weren't informed until we arrived for the excursion that the alternate beach would also be on the Dutch side of the island. Both beaches were quite busy but we enjoyed seeing the planes fly to close at Maho Beach. Watching the planes come in was amazing! Loved both beaches. Wellington was great! Appreciated the history and info the whole time. Well worth the money! We had a great time on our tour of St Maarten. We easily found our pick-up location and the group was very friendly and courteous. Our guides were great and pointed out a lot of interesting things about the island as we drove. They provided refreshments along the way and once we got to Orient beach we were able to get two lounge chairs with an umbrella and a drink for each of us for 10. Orient beach is beautiful and large so you can either stay on your chair, play in the ocean or walk along the beach. We loved both the Orient beach and the Maho beach, but the Maho beach is amazing as the huge planes go right over your head. I haven't seen anything like that and it was pretty thrilling. I would highly recommend this tour. They are very professional, timely and provide interesting information. Also the groups are smaller - we had around 15 people in the van which made it nice. I enjoyed my tour guy however I wish my crowd was different. Would definitely recommend for large groups rather than couples. Great trip overall! Had a little difficulty at first contacting the local guides to set-up the pickup from our cruise ship, but once that was squared away, the rest of the trip was awesome. Got to visit two great beaches. Would definitely recommend this excursion! Really enjoyed seeing the sights, especially Maho beach and the urchins by the ocean. Tour was excellent. My husband and I were treated very well. Enjoyed the historical knowledge our guide had not only St. Maarten, but also surrounding islands. Very relaxed and informal, blended in quite well with the island. At Orient Beach, If you are looking for a little solitude, but convenience of restroom and beach bartender, take a walk further down the beach to Coco resort. Maho beach is smaller and crowded, but crazy exciting with the planes flying directly over head as they land. The tour people were great. Very easy to meet up with after we debarked the cruise ship. I did not realize this was more of a tour rather than getting us to the beach. We really wanted at least an hour at both beaches however we got only half hour at Orient beach because we had to run to Maho to catch the big airplane coming in. We had more time at Maho but beach was crowded. We did have a nice lunch and tour guide was available to leave when we wanted.